York St Mary’s installation for 2012 was by Brazilian artist Laura Belém and consisted of a thousand cast glass bells suspended from the roof of the former church. 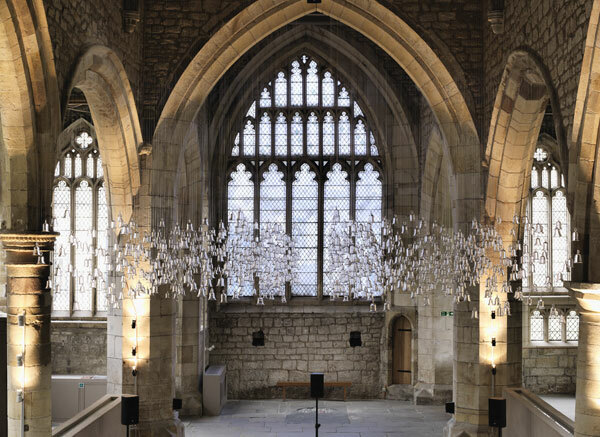 The installation was accompanied by a specially composed polyphonic sound piece, creating a 3-D effect to the sound of a narrated story. The story behind the piece was a free adaptation of an ancient legend about a temple of a thousand bells that was built on an island. Over the centuries, the island sank into the ocean, and with it, the temple. 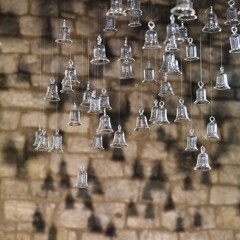 As the story unfolds, it reveals the attempts of a sailor to hear the music of those bells. 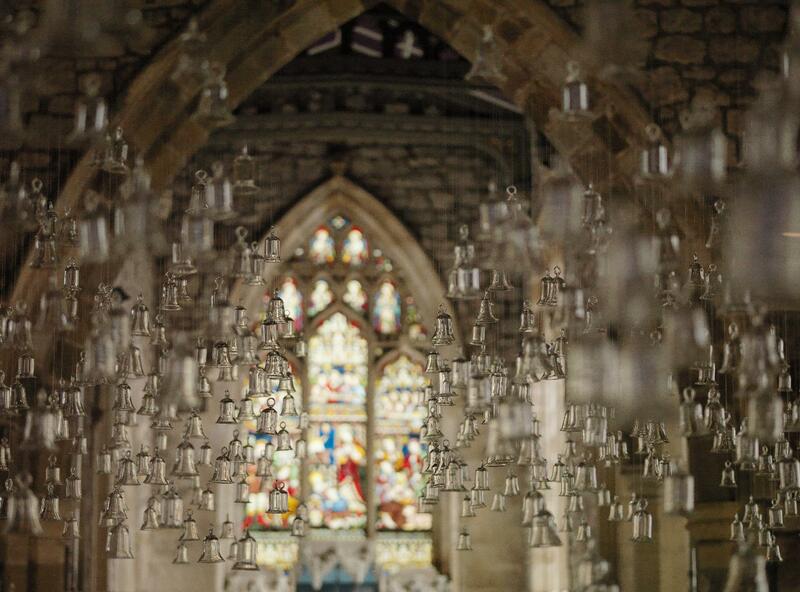 The glass bells were all individually hand-blown and hung with nylon strings in the nave of the former church. 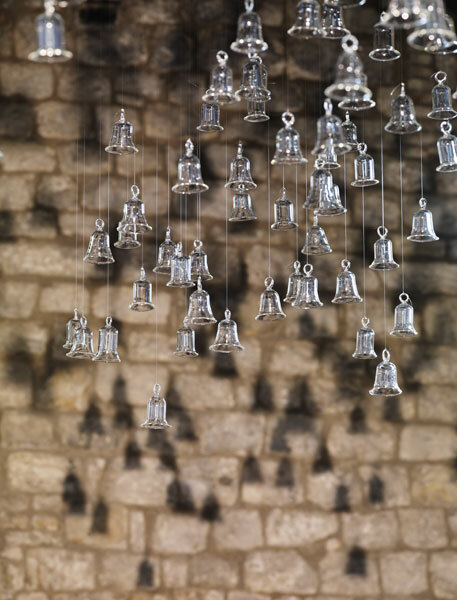 They did not have a clapper, creating a visual metaphor that matched the narrated legend, which tells about the lost music of the bells in the depths of the ocean. 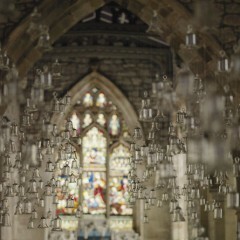 The mass of clear, translucent glass bells evoked a visual quality of water and notions of spirituality and evanescence. They also conveyed a sense of fragility, lyricism, dream, imagination, a sense of presence and absence, and memory and displacement. 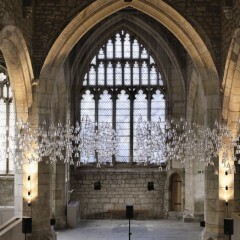 Originally commissioned for the Liverpool Biennial International 10 exhibition and housed in the Oratory, the work was reinterpreted and rehung for York St Mary’s.